The technology, developed by Prof Guntae Kim at Ulsan National Institute of Science and Technology (UNIST) in collaboration with material scientists and engineers at the Georgia Institute of Technology, depends on a well-understood phenomenon: the dissolution of carbon dioxide into water to produce an acidic solution, which occurs in nature when carbon dioxide dissolves in the oceans. Prof Kim and the team realised that this could be used to induce an electrochemical reaction. The creation of an acidic solution increases the number of protons in the water, each of which can attract an electron, and this implies that a battery system can be created. The “hybrid Na-CO2 cell” continues to produce electricity and hydrogen and does not regenerate carbon dioxide during charging, the team says. The system has been tested over more than a thousand hours with no damage to the electrodes. 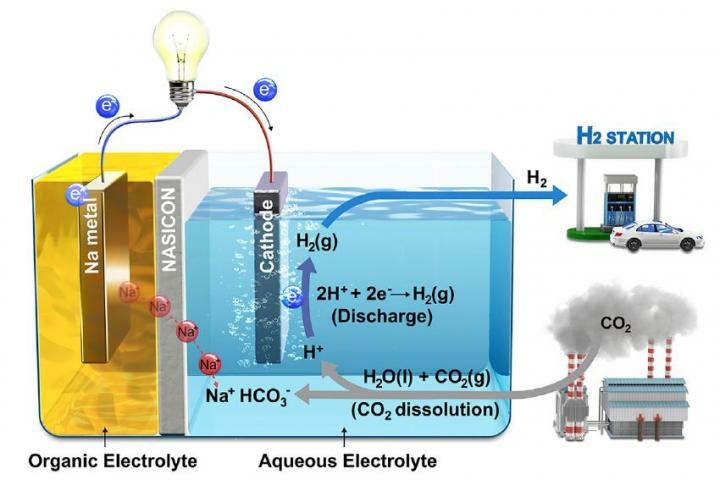 “This hybrid Na- CO2cell, which adopts efficient CCUS technologies, not only utilises CO2 as the resource for generating electrical energy but also produces the clean energy source, hydrogen,” said Jeongwon Kim, electrical engineer at Unist and co-first author for the research. The article suggests that electricity and hydrogen are generated for free while at the same time CO2 is captured. But “with no damage to the electrodes” is not correct because the system eats the sodium anode. After time the anode must be replaced. So the system converts CO2 and sodium metal into sodium bicarbonate while producing hydrogen and electricity. I would like to see the energy balance including the energy required to produce the sodium metal. Fascinating even though the electro-chemistry is well beyond my memory cells! A “Sodium SuperIonic Conductor” (SSIC) has a science fiction feel, but is clearly essential to preventing an explosion. As Mr. Heirman notes it looks as though one is reacting sodium with carbonic acid, which would not seem to be energy positive in that a lot of energy is needed to make the sodium in the first place. The unstated difficulty is in indeed in converting Sodium carbonate back into metallic sodium. Is that to be done in the cell or off-line someplace? Looks like a clunky cross between a fuel cell and a battery to me. Besides the net energy demand, the proposal doesn’t eliminate CO2. It only converts it to sodium bicarbonate – same as simple scrubbing CO2 gas with NaOH. What do you do with zillions of tons of bicarbonate produced from the captured CO2? Sodium bicarbonate has all sorts of environmentally useful cleaning, gardening, and medical applications as well as its use in cooking, where it is known as ‘baking soda’. I have no idea how many ‘tons’ of the stuff would be produced by this process. But I suspect they would find use, and with less impact than many commercial cleaning products today. Well, you’d never suffer from indigestion again, plus Cadbury could make an unlimited amount of Crunchies. These two points could be linked…. I see this to be in early stage of development and the excess bicarbonates being a valuable antibacterial substance to be used in many applications. Rather than questioning the energy positive impact, I would be interested to understand how scalable this process is to be used e.g in countless manufacturing processes where CO2 emissions are unavoidable. why not utilize waste Aluminum, as this is produced in far greater tonnage than sodium metal? There are already groups developing this is a source of hydrogen on demand, and obtaining clean by-products. In this grand scheme utilizing sodium metal, where does the sodium come from? What is the carbon footprint of that production? I susapect the answer lies in electrochemistry. Aluminium is much less reactive than sodium. Sodium metal is a co-product of chlorine production from electrolysis of brine; this is, of course, a high energy process but chlorine remains in demand as a chemical feedstock. The only reason it (Aluminum) fail to react would be the oxide layer. Get past that (and it can be done in a number of ways), or prevent it from forming in the first place, and you have a perfectly good anode material. Aluminum battery news was all over the place not long ago. I see. I just read up on industrial sodium. It is the result of electrowinning sodium from a 1:3 molar ratio of molten sodium and calcium chlorides. Yes, the byproduct is chlorine gas which has its favored sanitation uses, and reagent uses. The Downs cell is a pretty amazing engineering feat, in that it prevents the molten sodium liquid that drips upward off the cathode from instantly reacting with either oxygen or chlorine. In the USA, we still utilize a similar process for production of magnesium and chlorine. The Chinese are well known to far outproduce the US process by committing gross pollution through the reaction of MgO with carbon. I suppose that once all “civilized” nations recognize that some chemical pathways are preferred over others, then the debate should cease. My personal gut feelings on this is that the marketplace should be the ultimate arbiter of these debates, as pounds or dollars make a perfectly acceptable means of voting in such a case. All that aside, the Latin “caveat emptor” takes on a whole new meaning in the light of environmental stewardship.